Despite the fact that there are 16 lakes each of them is unique and unforgettable, because all possessed their own features. So travelling from one lake to another one will bring you incomparable pleasure. Moreover, lakes are abound in fish, they also have three rare and endangered species of fish: the vendace, the schelly and the Arctic charr. 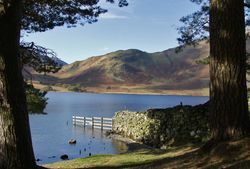 Here is the full list of lakes: ·	Bassenthwaite Lake ·	Buttermere ·	Coniston Water ·	Crummock Water ·	Derwent Water ·	Elterwater ·	Ennerdale Water ·	Esthwaite ·	Grasmere ·	Haweswater Reservoir ·	Loweswater ·	Rydal Water ·	Thirlmere ·	Ullswater ·	Wast Water ·	Windermere . "Fells" is the local name for the hills or mountains in the Lake District. They are relatively small (none being much over 3000 feet or 1000 metres) in comparison with other world mountain systems, nevertheless they offer a great number of challenging and fascinating hillwalks. The other attractive side of visiting fells is the fact that here you can rest from modern development. You can feel the spirit of wildness by freely walking across the fells, climbing crags and observing the scenery which is almoust the same as it was seen by Daniel Defoe in 1724 or Celia Fiennes in 1698.